Space-saving under counter design for on-demand filtered water. 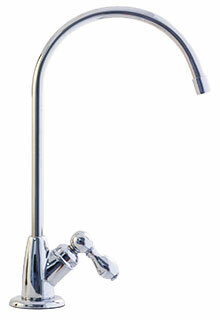 The AQ-5100 Single-stage under counter water filter comes with a stylish, all-metal chrome finish faucet. 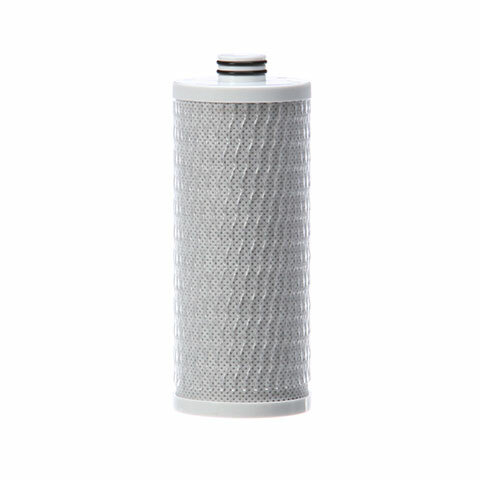 Single-Stage Under Counter Water Filter - Chrome is rated 4.7 out of 5 by 78. Replacements engineered for ease. No need to disconnect hoses or water lines. Eco-friendly filter housing easily twists off so replacing your filter is a snap! 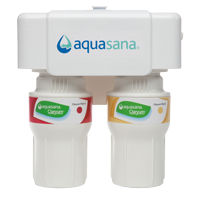 One Aquasana Claryum® filter gives you 5x the capacity of the leading gravity-based pitcher at only 13¢ per gallon with Water for Life. Reduces 77 contaminants including chlorine, chloramines, heavy metals, pesticides, herbicides and industrial solvents. Filter lasts up to 3 months and features easy twist-off design. Rated 5 out of 5 by BarbH from I love my Aquasana water filter! I’ve been using it for 2 weeks now and find that I am drinking more water because it tastes so good. I love how easy it is to use, so convenient. It was very easy to install too. Rated 5 out of 5 by Jimbo57 from Simple to install I bought this single stage filter for my refrigerator ice maker. It replaced an in line filter I had purchased from Aquasana a couple of years ago. This filter is so much easier to replace than an in line one and it filters much more of the things you don't want in your water or ice. Installation was a breeze. Rated 5 out of 5 by Jcharvey from Fantastic water Had this about a month, it is great! Very easy to install. Great quality. Rated 5 out of 5 by Lorie from Great tasting water Only been using for two weeks but so glad we made the purchase. Faucet works and looks as shown on website. This is much better than constantly refilling a water cooler in the fridge. Rated 5 out of 5 by Jennie 5 from I love this system! Filters my water so a in the house will drink it faithfully. 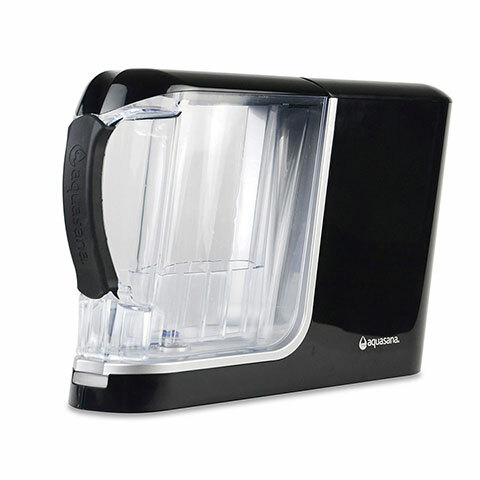 Rated 5 out of 5 by Fam from Fantastic purchase We use this for drinking water and water for coffee tea soups etc. I wanted to stick with public water - being environmentally wasteful by buying water from a private company was not something I would start doing. The change is amazing, it takes the chlorine taste out but in addition tastes very pure and delicious, and we can feel the difference when we drink it. Water is life! 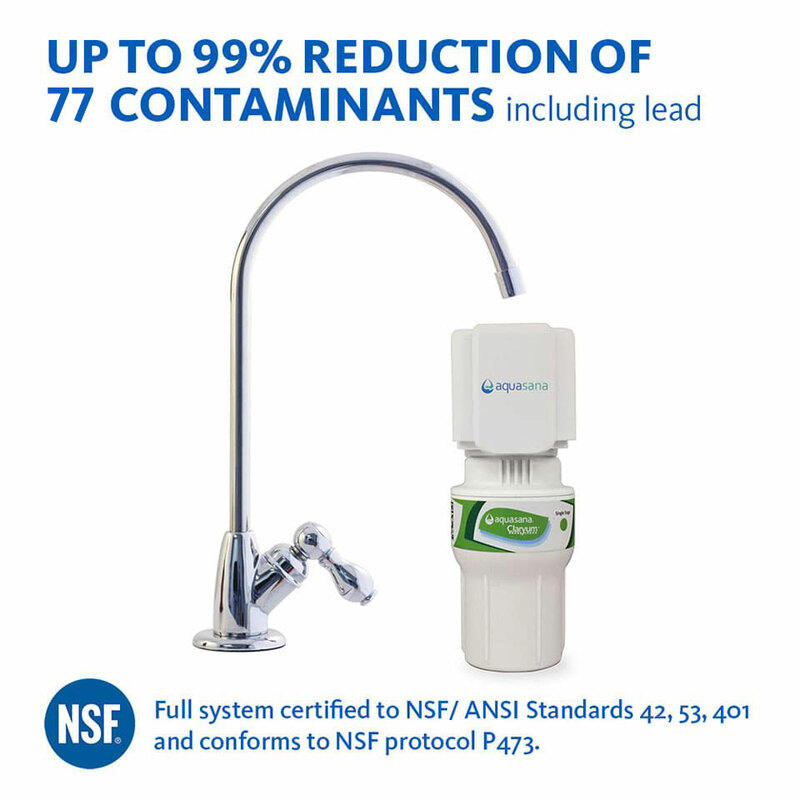 I chose this because it's certified with NSF to filter chlorine, chloramine, asbestos, cysts, lead, mercury, VOC, bpa, medications, emerging contaminants, etc. And it was a lower price than many filters that didn't cover those. It filters what's known in our local city water supply and more. We are so happy with this purchase! Rated 5 out of 5 by Mike Taylor from Easy to install, has a high nech lenght, very satisified wit Very satisfied with product. I'm allergic to coconut &amp; palm. Do your filters use coconut shells to filter the water? Thank you. I have had my single stage for a few months . It is leaking around the housing unit. Do you have any suggestions for troubleshooting? &nbsp;My sink fixtures are a brushed product. Probably brushed nickel. Do you carry it in the brushed finish? It really should match. But I would like this product..
how will I know when to replace the filter? Is there an indicator somewhere? Are replacement washers and &quot;o&quot;rings available for the faucet on this water filter system (5300+)? 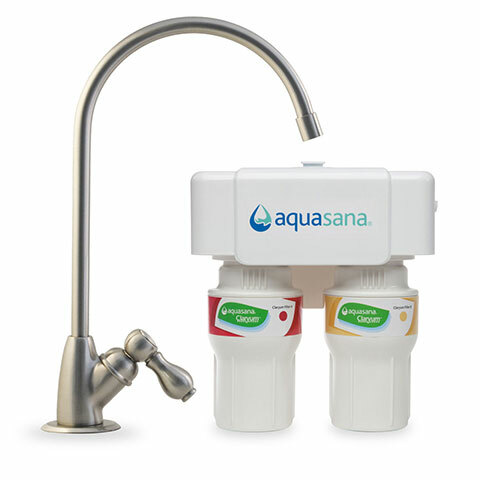 does the Aquasana single stage filter out sodium from a whole house water softener, so as to make faucet water more ''drinkable''. Also, will the water be ''compatible'' with a coffee machine like a Keurig??? Thanks.